We discovered Swajal while researching social entrepreneurs. The team, a mother and son, run this social enterprise and seek to remove obstacles making clean drinking water inaccessible in India. Vibha Tripathi holds a doctorate in Physics and Natural Sciences from IIT Kanpur, and her son, Advait Kumar, a Penn State University graduate specialized in Electrical Engineering. Through their initiatives, solar power is harnessed for energy, remote monitoring is accomplished through Internet of Things technology, and payments can be made through mobile devices or RFID smart cards. The decentralized water purification systems provide clean drinking water at affordable prices. Vending machines can be found in stores, railway and metro stations, hospitals, schools and urban communities as a result of their hard work. Their franchise model provides also an income stream for franchise owners. 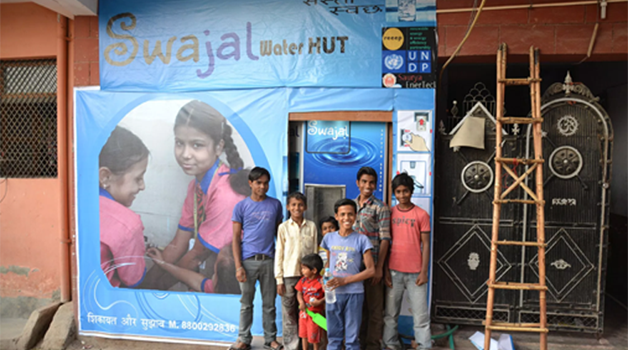 Established in 2011 and working in collaboration with funding partners, government, corporation and franchisees they’ve been able to provide 4 billion liters of clean water. Both Vibha and Advait embody passion, technical know-how and a commitment to addressing the challenge of clean water accessibility. Swajal is a perfect social enterprise candidate that Bertzman Social Ventures can assist with scaling growth and impact. Take a few minutes to learn more about Swajal!